First Launched in 1985, this is the ideal bar/restaurant that can take you from after work drinks and snacks to an exciting evening full of vibrant live Jazz. 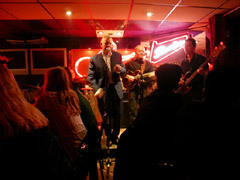 Jazz after Dark has it all, a late night restaurant, cocktail bar and jazz club right in the heart of Soho where cool Jazz, hot Blues & Latin are played live six nights a week. The place is usually buzzing with a young crowd and advanced bookings are highly recommended. Jazz after Dark has had its fair share of well known visitors; Greta Garbo was one of the first to dine here when she visited London in the eighties. Charlton Heston, Bill Murray & Alison Moyet are amongst some of their late night jazz lovers. Pete Doherty & The Libertines performed here in their early days and Pete still pops in from time to time, Amy Winehouse is also a regular and she often makes a surprise visit and sings with the band. There�s a funky Jazz lounge with a good selection of cocktails and shooters together with a selection of champagnes and wines. The size and set up of the room creates a friendly and fun environment in this cosy and informal venue. This restaurant is a popular choice for birthday parties, hen nights and leaving dos. It can accommodate up to 50 guests and the staff are more than happy to accommodate any requests or special party ideas. This interesting menu has a little something for everyone. The restaurant offers cuisines from around the world, with menus changed regularly. You can choose from the a la carte or special set menus. There is a good variety of dishes, ranging from the Egyptian Mezze to a selection of Spanish Tapas.